1. We reserve the right not to accept any order. Once your order is accepted by us, a contract will come into force, on the terms and conditions set out here. 2. We will try to deliver your goods as soon as practicable. You should tell us as soon as possible if you do not receive your goods within one week of placing your order or within one week of any estimated delivery date that we give you. Please note that any dates quoted by us for delivery are estimates only. If we are unable to deliver your goods within 30 days of your order, you may cancel your order and get a full refund for those goods. 3. When you receive the goods, you should check them as soon as possible, and let us know within 10 days of receipt if there are any problems. If possible, please retain all packaging until you are satisfied with the goods. You will be responsible for any loss or damage to the goods which occurs after they have been delivered to you. Nothing in this clause shall prejudice the rights of the customer under this agreement. 4. We will require payment of the price for the goods in full before we despatch them . 5. All the goods that we supply will remain our property until you have paid for them in full, including all delivery charges. If you sell the goods you agree to hold the sale proceeds upon trust for us until you have paid us for them in full. 6. Every effort is made to ensure that our prices and descriptions are accurate at the time of going to press. If an error is found or if manufacturer's prices or products change, we will inform you as soon as possible and offer you the option of cancelling your order or reconfirming your order with the revised price or product. We are under no obligation to provide goods to you at an incorrect (lower) price if the pricing error is obvious and could reasonably have been recognised by you as a pricing error. 7. The information and advice contained in our sales documentation is for general guidance purposes only. You are responsible for determining whether it applies to your particular situation. In particular, please read all manuals and safety instructions provided with our goods, and follow them carefully at all times. 8. You can cancel your order for any reason and get a full refund at any time before you receive the goods, or the end of 7 working days after the day you receive the goods. A working day is any day other than weekends and public holidays. To cancel your order you should write to us within that time. b) you must return the goods to us at your own cost . d) if you do not return the goods as required, we may charge you the costs of recovering them ourselves. 9. This right to cancel your order does not apply to audio or video recordings or computer software which has been unsealed or goods which have been made to your specifications or are clearly personalised or are liable to deteriorate or expire rapidly or which by their very nature cannot be returned. 10. You may return goods for a credit or to exchange strictly in accordance with our published Return Policy, and subject that in the event of a conflict between these terms and conditions and the Returns Policy, these terms and conditions shall prevail. 11. We will not be liable for any delay in delivering the goods which is due to events or circumstances beyond our reasonable control or for any business losses. 12. Nothing in these conditions will limit our liability in cases of fraudulent misrepresentation, negligence causing personal injury or death or defective products causing personal injury, death or damage to non-business property. 13. If we fail to enforce any of these conditions, that does not mean that we have waived any of our rights and we retain the right to enforce any of these conditions at any time. 14. Nothing in these conditions affects your statutory rights as a consumer. You may obtain information about your statutory rights from your local Trading Standards Department or Citizens Advice Bureau. 15. In the event that you are a consumer outside the United Kingdom, clause 6 shall not apply in any event and you will be supplied with a separate terms relating to export sales. 16. English law shall apply to these conditions. We must be contacted before any return is made to obtain the necessary returns reference. Should you receive any parcel from us that contains damaged goods this should be notified to customer services who will arrange for collection and replacement, within the 7 working day period. 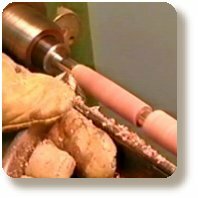 Our woodturning course vouchers are valid for 12 months from purchase date. Once a course date has been booked by you it is non-transferable.